Men's eyeglasses frames must be a precision tool, and still look good. Men want their eyeglasses to be sturdy, light, and with perfect lenses. At Eyeglasses.com, men can build-your-own eyeglasses with the exact combination of precise function and fashion that is perfect for you. First, begin with the right men's eyeglass frames. You can choose from thousands of styles in hundreds of brands. You can use our advanced search function to find the right frame with the perfect attributes. Once you have found your frame, you can “add lenses” to it from the frame detail page. This will take you into the Eyeglasses.com Lens Wizard. Our Lens Wizard is a step-by-step program that walks you through the lens selection process. It asks you questions and provides the information you need to make choices and decisions. When you are done, you will have created the perfect pair of men’s eyeglasses just for you. The hottest trend in 2014, 2015 and beyond is the heavy, plastic frame style (check out Anglo American for Men). Not every man can pull this off thought. If you have been wearing glasses for a long time, give it a try. If you have never worn glasses before, you may want to start with something a little more innocuous. Plastic frames have a lot of advantages from a style perspective. There are many more colors to choose from, and if you have a stronger prescription, the thicker edge of the plastic frame will hide the lens thickness. Plastic frames create more of an aura, either to inundate or exaggerate or hide features, which could be very useful in certain situations. There is a huge variety in rimless frames for men now, since most manufacturers have some rimless frames in their collection. The rimless look is more about precision, clarity, and openness. If you are very well groomed and especially cleanly shaven, the rimless frame adds to the sense of perfection. Think Donald Rumsfeld (the look, not the politics), and you will see how men of power and in the limelight use rimless eyeglasses to craft that look. Most of the major designer brands now offer a selection of mens frames, or unisex frames. The big designers do men's frames in layered colors (plastics), or in different shades of grey (rimless and metal frames). Some men have difficulty finding frames that are large enough to do the job without pinching on the temples. You can search for large frames by size using our advanced search, or we recommend the XXL brand and also US Army glasses brand. 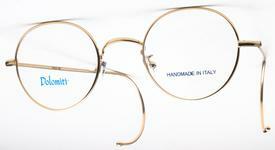 Also, the most popular big eyeglass frame of all time it the Jonathan frame.